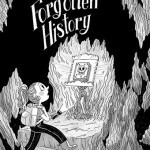 Forgotten History Anthology on Kickstarter! Help us raise $1,880 to fund the Forgotten History Anthology featuring a brand-new Dust Bunny Mafia short story. Become a backer today! So those flaps have more than one use! Nice! Love it, Bret!